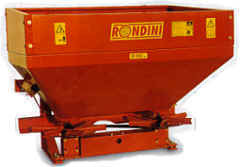 The Rondini range of fertiliser spreaders are extremely simple to use, giving farmers an economical tractor mounted spreader suitable for all types of spreading applications. Many models are available from a small tow behind for the ride-on mower, to one tonne machines capable of delivering larger quantities in a single pass. 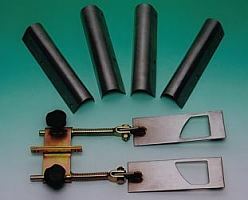 Several options are also available such as powder agitator and single or twin side chute. 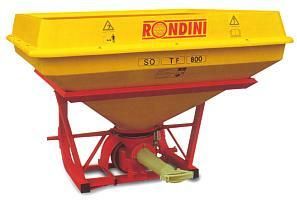 Our NEW RONDINI SPT160 is a trailed ground-driven Spreader. It has been designed primarily for large gardens or small areas. 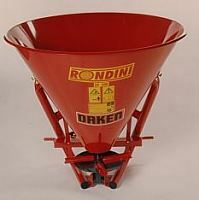 The hopper has maximum carrying capacity of 180kg of fertilizer. · Adjustable spreading limiter for windy conditions. · 3 spreading patterns at the touch of a lever. · Adjustable drawbar to suit all small tractors, ride-on mowers and 4 wheel Quad bikes. 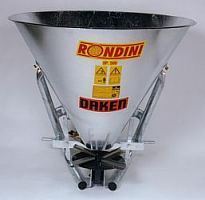 Our NEW RONDINI SP500 offers a simple, effective and economical solution to spreading pilled, granular or powdered fertilizers. 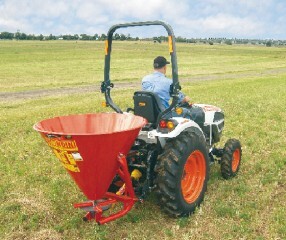 The hopper has a maximum carrying capacity of approximately 500 Litres of fertilizer. · High quality components and design. · Power coated frame and hopper. 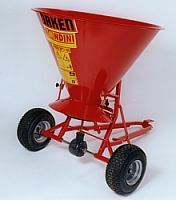 Our NEW RONDINI Twin Spinner Spreaders are ideal for spreading large quantities of fertilizer over a wide area, with the minimum number of passes. With a variable throw of 8 to 18 m, and capacities up to 1 tonne, these big Twin Spreaders represent excellent value for money. · Twin cable operating remote control, for use in cab tractors. · Optional accessories include Twin Side Throw attachment for orchard use. PLEASE NOTE: Bag size quoted equals approx. 50 Litres. This ensures long life and trouble free operation. · The oscillating unit represents the heart of the machine, which is made of high quality material. · It's most important feature, is that it works in an oil bath to prevent any risk of seizures. · It also has a fibreglass reinforced hopper. · There are three models available that range from an 12 to 20 bag capacity.